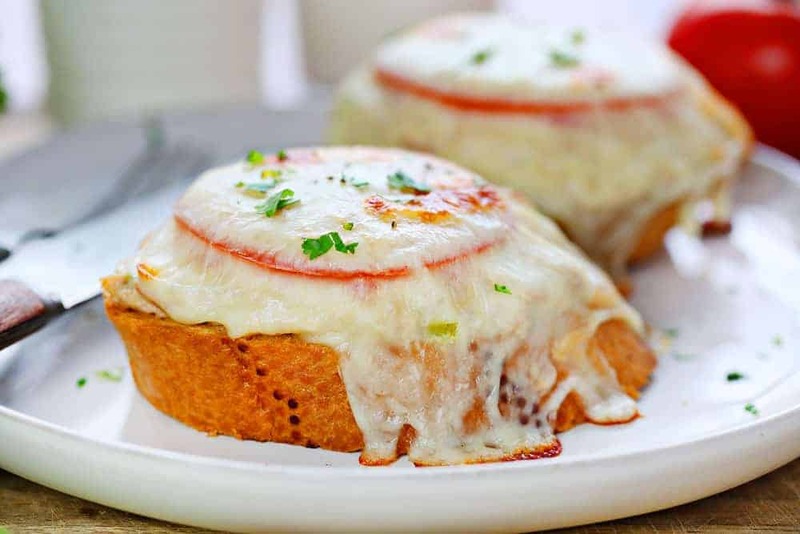 This Tuna Melt is served open-faced and will transport you to your favorite deli with delicious homemade tuna salad, fresh sliced tomato, and ooey-gooey mozzarella cheese, all on top of freshly toasted french bread! This would also taste amazing on my homemade Amish White Bread! Every deli has a classic tuna melt sandwich. 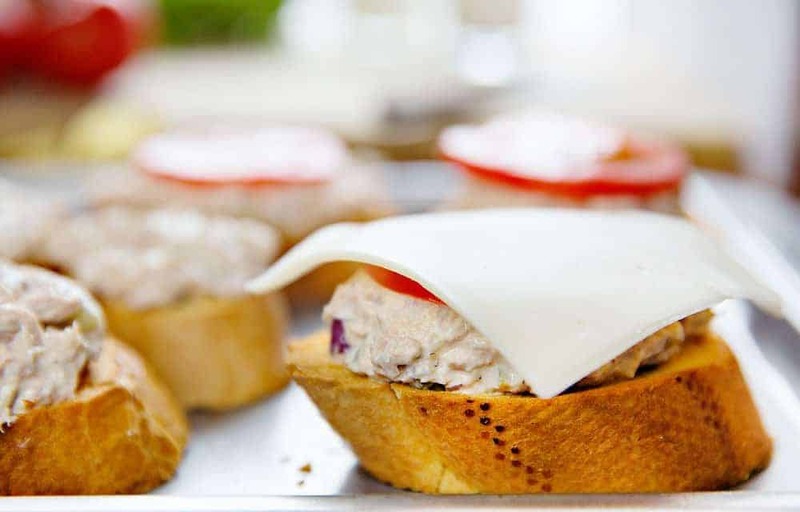 This open-faced tuna melt recipe is one that we make from the comfort of our own home all of the time. Great deli flavor, direct from your kitchen! Does it really get any better than that? It is quick and easy to prepare, and the kids just love it! This sandwich tastes amazing with a big slice (or two) of fresh tomato covered in cheese. In the summer we grow a relatively large garden with TONS of tomato plants, from Cherry to Heirloom. When we can, we use those, but either way, you will not want to skip that very important ingredient. The tomato compliments the tuna melt so well! We sometimes take it a step further and serve this up with some homemade tomato soup! There are a few things that I highly recommend when making this tuna melt recipe, and there are a few variables that you can change up. 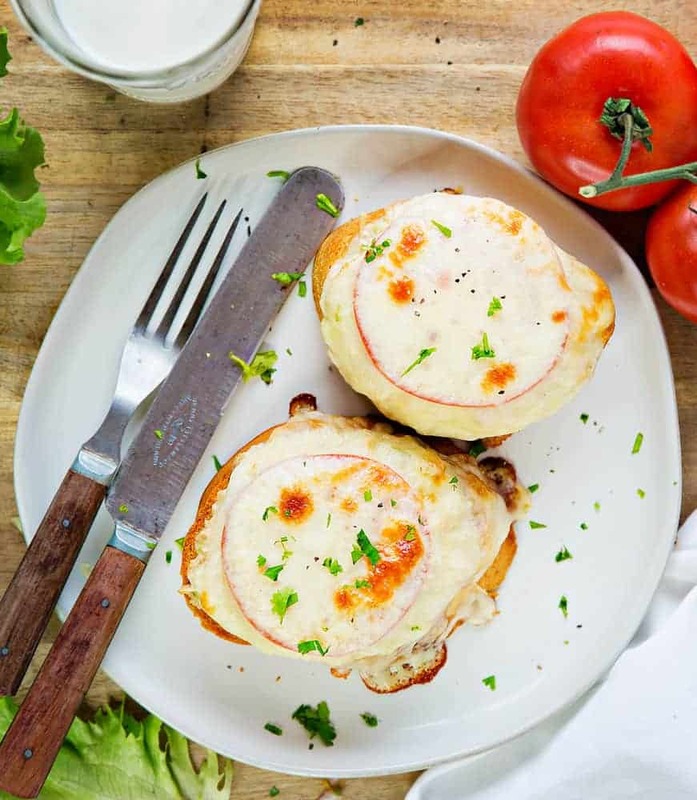 Cheese – We used mozzarella for this recipe, but you can change this up. Some that we have tried and love are Havarti, Muenster, Cheddar, and Provolone. 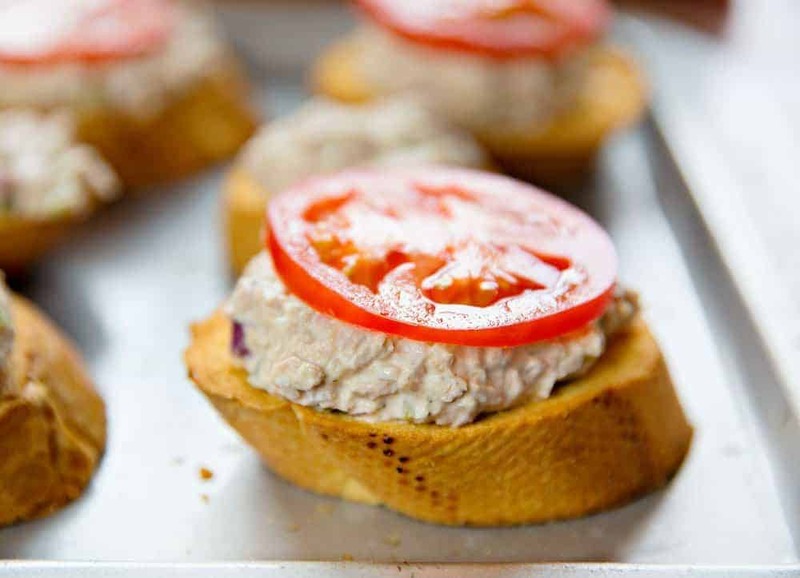 Bread – We like a good crunch from the bread, I highly recommend toasting the bread for a bit BEFORE you add the tuna Salad Mixture, tomato, and cheese. For the bread, a good thick grain bread is best, such as french bread, hoagie rolls, or sourdough. Any homemade bread would be amazing as well, such as my homemade Amish White Bread. Butter – If you are looking to lighten this recipe up a bit, you could skip the butter. Personally, I like the flavor it brings to the sandwich, but you could toast the bread dry, or with a light spray of extra virgin olive oil as well. Mayonnaise – There is some debate out there about mayonnaise versus miracle whip. We go Mayo all the way. Miracle Whip has a distinctly sweeter taste which doesn’t mix well with the celery salt seasoning in this recipe. The hardest part about making this recipe is waiting to devour it. 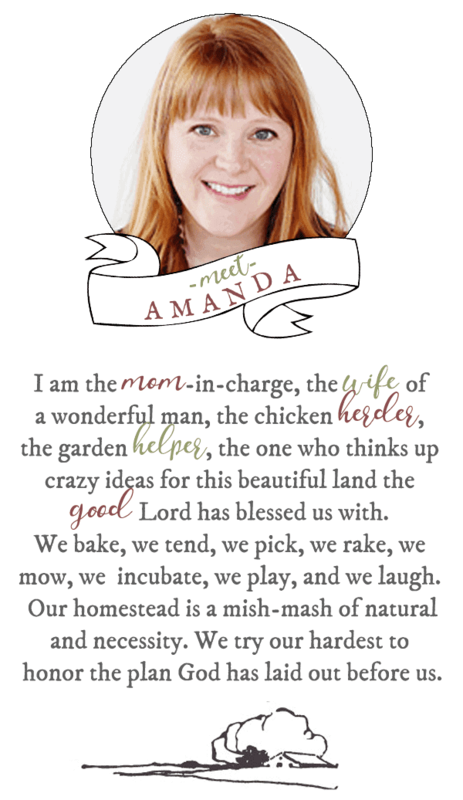 The steps are really simple and basically just a combination of chopping, layering and baking. Chop and slice your ingredients. Butter and toast the bread. You will want to spend about 5-7 minutes on each side or until the bread starts to get golden brown. It will go back in the oven once the rest of the ingredients will be added, so you don’t want it to get too dark just yet. Prepare the Tuna Salad. This includes tuna, mayo, celery salt, pickles, shallots, garlic, lemon juice, salt, and pepper. There are a lot of salty items in this recipe, so be careful to not add too much. You can always add more if you need it. Give it a good taste test and then add more if you want. Place one scoop of tuna on the toasted bread, top with a slice of tomato, and a slice of mozzarella and pop it back in the oven (on broil now) for about 5 minutes or until the cheese starts to bubble. 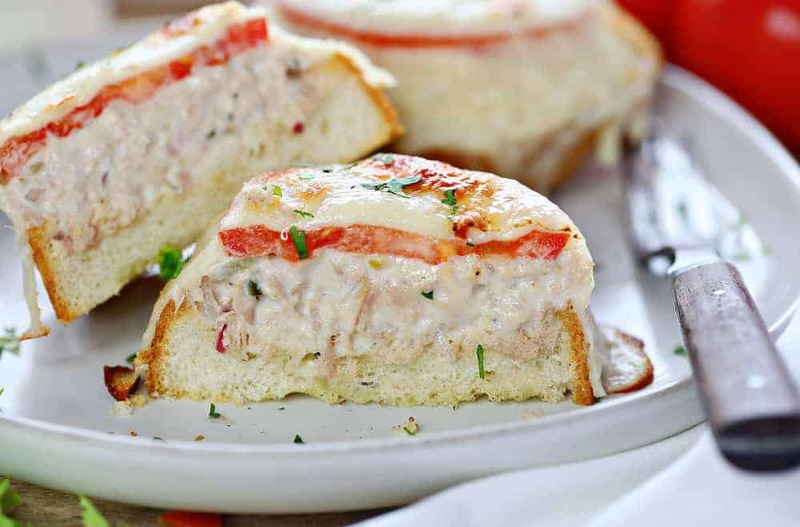 This Open Faced Tuna Melt sandwich will transport you to your favorite deli with delicious homemade tuna salad, fresh sliced tomato, and ooey-gooey mozzarella cheese, all on top of freshly toasted french bread! This would also taste amazing on my homemade Amish White Bread! Slice French bread into 1-inch sandwich slices. Places slices in baking pan and lightly coat the top with butter. Bake for 5 minutes and then flip, lightly coat the opposite side with melted butter and bake for another 5 minutes (slices should be a light golden brown). Meanwhile, in a medium bowl, combine tuna, mayonnaise, celery, salt, shallot, pickle, lemon juice, garlic, salt, and pepper. Remove bread from oven and spread tuna mixture on the bread. 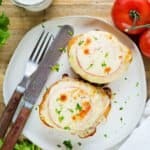 Top each with one slice tomato and one slice of mozzarella. Return baking dish to oven and broil for 5-7 minutes or until cheese is golden and bubbly.